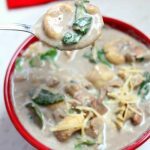 Slow Cooker Chicken Mushroom Tortellini Soup: a creamy, comforting cream of mushroom soup with tender bites of chicken, cheesy tortellini, fresh spinach and topped with freshly grated Parmesan cheese. 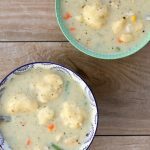 If you’re a big fan of cream of mushroom soup (which I am) then you’ll love this recipe for Slow Cooker Chicken Mushroom Tortellini Soup! 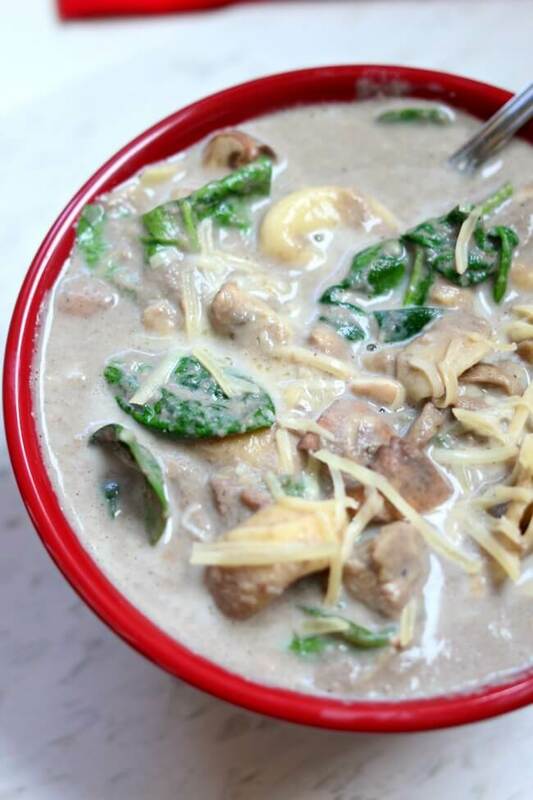 It’s filled with lots of mushrooms that are eventually pureed to make the base of the soup. I used cremini mushrooms but white button mushrooms would work just as well. 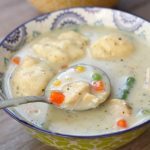 I also decided to bulk up the soup with some chicken. 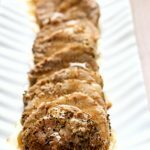 I decided to go with boneless skinless chicken thighs but you can also use breasts for this recipe. The chicken breasts will stay tender because they’ll be totally enveloped in liquid while cooking. After the mushrooms, chicken and broth have slow cooked all day I added in a bag of frozen tortellini and some spinach. Let the tortellini cook on high for a few minutes and voila! The soup is done. 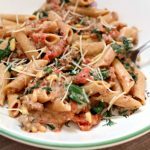 For this recipe I used my Kitchenaid 6-Quart Slow Cooker. 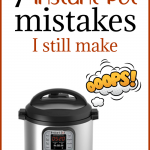 I prefer this slow cooker over almost every other slow cooker because it cooks evenly and low. It also has a medium setting as well as the normal low and high settings that other slow cookers have. 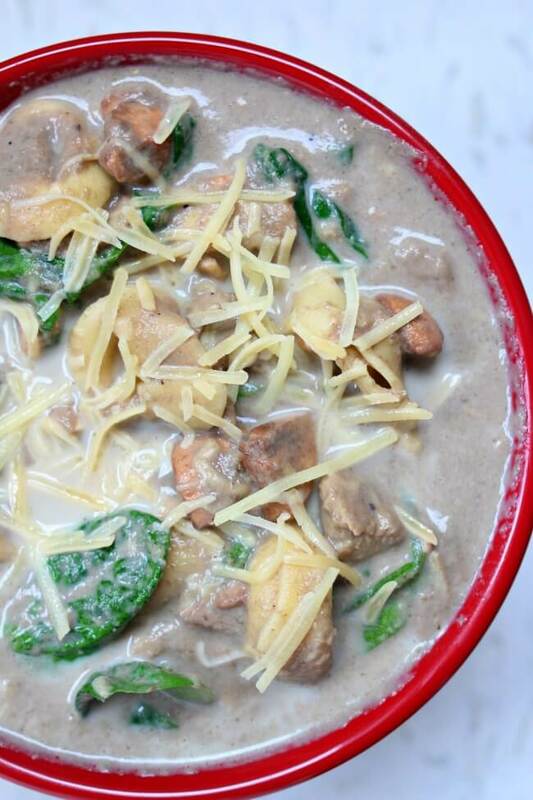 A creamy, comforting cream of mushroom soup with tender bites of chicken, cheesy tortellini, fresh spinach and topped with freshly grated Parmesan cheese. 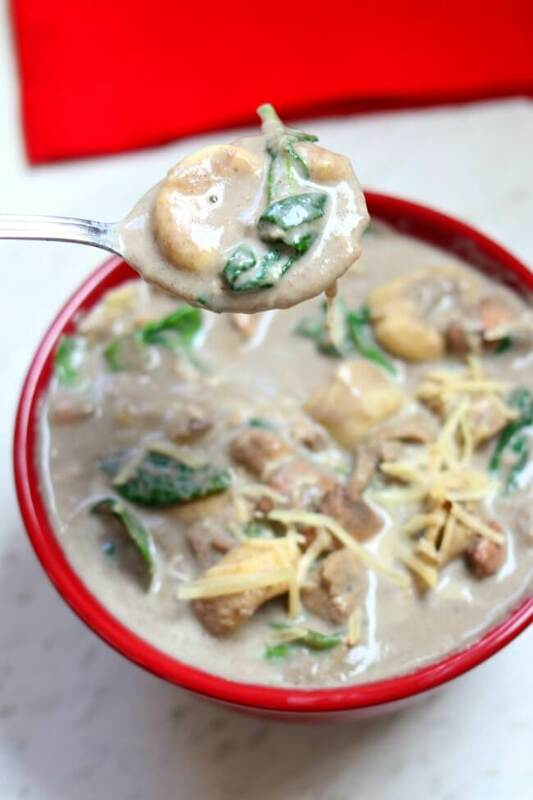 Add 16 oz sliced mushrooms to theslow cooker. Add onions, garlic cloves, oil and thyme to a microwave-safe dish. Microwave for 5 minutes, stirring every 90 seconds. Add mixture to the slow cooker. Add chicken broth, salt and chicken to the slow cooker. Cover and cook on LOW for 6-8 hours or on HIGH 3-4 hours. Remove chicken and place on a cutting board and let rest. 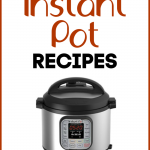 Puree the contents of the slow cooker in a blender or with a stick blender. Add in warmed half and half (warm it so that the soup doesn’t curdle), frozen tortellini, 8 oz chopped mushrooms, spinach and vinegar. Stir. Salt and pepper to taste. Shred the chicken on the cutting board and then add back into the slow cooker. Ladle into bowls and top each bowl with 1 Tbsp Parmesan cheese. In this week’s episode of The 365 Days Podcast, Heidi and I talk about the number one predictor of personality–birth order! Listen to this week’s podcast now and let us know where you fall in your family and how you believe it has affected your personality. Just text us or leave a voicemail at 858-365-3297. You can subscribe to our podcast in iTunes or through other podcast apps. Just search for The 365 Days Podcast! When does the tortellini go in? Thanks for catching my error, Lauren. I just corrected the recipe!! Sorry about that. Anyone have a substitute for the onions? I’m allergic. I might just leave them out. Hi Karen! I saw the review you did of your painted cabinets. They look beautiful. Are you still happy with them? Do you feel the knots came out looking clean? Is it Chameleon Paint-Utah’s Paint Pro? Thanks for your help:) PS, I also love some of your recipes. Yes, I love how they came out. I am very happy! It’s Chameleon Paint…Utah’s Paint Pro.